REVOLUTIONARY AND EVIDENCE-BASED TREATMENT FOR FOOT PAIN! The EOTTS-HyProCure procedure is normally performed under a local anesthesia; some patients also prefer to have an IV sedation to completely relax them during this 20-minute procedure. One of the many advantages with this procedure is that it can be performed on both children and adults. Even when the HyProCure stent is placed into a child’s foot, it is unlikely that it will have to be replaced later in life. The good news is that the procedure is reversible if needed. EOTTS-HyProCure® is an evidence-based and minimally invasive procedure, which may help you stop suffering from pain and many side effects of misaligned feet such as knee pain, hip pain, and backpain. This revolutionary procedure has helped thousands of patients globally.. Typically, most patients after the HyProCure® procedure are back to normal walking within a few weeks. The bones, tendons and ligaments throughout the foot and the rest of the body will adapt to the corrected position over the following several months. 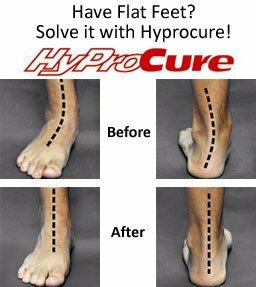 The photos below show well-aligned foot after the HyProCure procedure. It stabilizes and correct your internal misaligned joint, therefore fix the underlying cause.